Question #92: What do you think? I saw the following segment when I was flicking channels. The sports part of the news came on and…well, you understand. Ellen was on and I saw Reece Witherspoon was coming up…and I like her and so I thought I’d stick around. 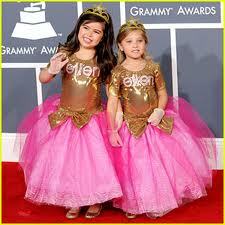 But it wasn’t an interview with Ellen, she was having ‘Tea with Sophia Grace and Rosie’. I thought, on one level, it’s ‘cutish’ BUT for the most part I thought – This is sort of imagery and behaviour that is making our problem worse. It’s cute, but ALL the compliments, from both the girls and (mainly) Reece, are about what they’re wearing and their attractiveness. There is a moment where one of the girls breaks into singing a few lines of Adele’s song (Rolling in the Deep, I think it was)…and it’s wonderful. She’s amazing, actually. So why the circus show? Question #93: Why can’t we showcase every girl’s wonderfulness, without those narrow, fickle images where girls can only talk about how pretty they are?